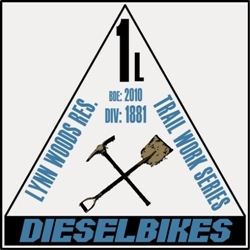 Below is a list of trail maintenance projects for 2010. We are happy and proud to be involved with maintaining some of the best Boston Area trails. We look forward working with our club members and additional volunteer help from the local riding community. This will be a trail day to complete unfinished work and repair any potential problems that may have resulted from weather conditions and or user traffic. Additional rock armoring and bench cutting will be completed to firm and expand the trail thread. The removal of trees in the general area for use as trail boards and berming will be required on each of the three switchbacks traversing the hillside. We estimate total time to complete this project will be 8 hours spanning one work day utilizing our club members and other volunteer resources. This will be a trail day to complete unfinished work and address potential problems that may have resulted from weather conditions and or user traffic over the last 3 years. Rock armoring and bench cutting four different turns located on the mid climb of Ridge Run Trail will be the primary focus since all current turns were installed without support to allow natural compacting by user traffic and seasonal weather conditions. We estimate total time to complete this project will be 6 hours spanning one work day utilizing our club members and other volunteer resources. A trail braid currently exists that was installed by an unknown party to by-pass the current problem. This trail braid runs over solid rock formations and will be ideal as a long term solution with some modifications to make it more park user friendly. The old section will be closed and blocked by cutting down dead trees in the area. The section will be cleaned and trenched to assist water drainage of the hillside reducing water pooling and further erosion in other trail sections. We estimate total time to complete this project will be 8 hours spanning over one work days utilizing our club members and other volunteer resources. We propose to install a wooden ladder bridge to span the present wet area and allow water to pass under as required during wet periods. The approximate length of the ladder bridge will be 24-feet long and 35 inches wide. Both ends of the bridge will be rock armored to develop a stable transition to the trail thread and prevent additional erosion from potential water run-off. We estimate the total time to complete this project with be 12 hours spanning over a two day work period utilizing our club members and other volunteer resources.